حرصا من هيئة الاعلام لمواكبة التطورات التقنية في شتى الميادين، قامت هيئة الاعلام بتحديث الموقع الالكتروني الخاص بها تحت النطاق www.mc.gov.jo بالتعاون مع ايكو تكنولوجي. ABS is a consultancy group specialized in the advancement of business processes for SMEs through the deployment of business management solutions. ABS’ notable portfolio includes serving more than 70 clients in 9 different countries. STS is an information technology service provider with offices in 8 countries. Since 1989, STS has helped hundreds of companies in the MENA region establish a strong foundation to strategically grow in their respective markets. The partnership recognizes that ABS is one of STS’ top ERP vendors, while STS being ABS’ delivery partner for cloud services. This agreement allows users to run SAP Business One on cloud subscription which significantly contributes to reduced costs, enhanced productivity and flexibility, while guaranteeing data security. 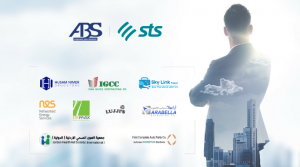 Networked Energy Services, Husam Nimer Drugstore, IGCC, ETA-max and many more are already benefiting from ABS and STS’ strong bond, and it is with great pride that we share their delight of running the top ERP software securely and efficiently thanks to both parties of the partnership. This milestone is a step forward towards our vision in providing SMEs with outstanding benefits through SAP solutions tailored to their businesses. We value this partnership and trust that our esteemed customers will greatly enjoy the scalability and flexibility of running SAP Business One on the cloud. ESKADENIA Software, the leading Jordanian-based provider of world-class software products and services, held its 18th Annual Conference themed “Above the Clouds” on the 24th of October 2018 at the W Hotel Amman. The Annual Conference recapped ESKADENIA’s achievements throughout its 18 years in business and emphasized next year’s benchmarks and visions. ESKADENIA Software’s top management presented the corporate strategy for the next years and expressed their satisfaction of recent employee performance and looked forward to upcoming achievements. During the conference, Managing Director of ESKADENIA Nael Salah and Executive Director Doha Abdelkhaleq recognized and awarded top performers for their devotion and remarkable work. The conference agenda included inspirational speeches by ESKADENIA’s management team followed by a session by Mr. Marwan Juma, CEO of Oasis500 and former Jordanian Minister of Telecommunications & Information Technology. Employees of ESKADENIA Software were happy to hear about their past accomplishments and welcomed future challenges. “The conference was great and it is always a proud moment to see how much the company has thrived” said Ruba Asad, Product Manager at ESKADENIA Software. Nael Salah and Doha Abdelkhaleq founded the company in the year 2000 with the vision of becoming a global provider of world class software products. ESKADENIA Software today has more than 230 employees and exports leading software products to around 30 countries worldwide. MenaITech, the region’s largest provider of human capital information systems (HCIS) services has recently signed an exclusive partnership agreement with Altibbi, a digital healthcare platform that provides its users with access to health advice 24/7 through its websites and apps. Altibbi will provide it’s ‘call a doctor’ service to MenaITech’s MenaME-Plus users (MenaITech’s Employee/Manager Self Service Mobile App). Today, tens of thousands of employees from different institutions rely on MenaME-Plus. The partnership agreement was signed by MenaITech’s founder and CEO, Dr. Bashar Hawamdeh, and by Altibbi’s founder and CEO Jalil Al Labadi. The partnership agreement resulted in the successful integration of MenaITech’s MenaME-Plus software to Altibbi’s application so users can seamlessly call trusted doctors and inquire about health related issues. This integration will provide ‘call a doctor’ service to MenaME-Plus users allowing them to call a network of experienced and qualified doctors 24/7/365, anywhere. This service will increase employee’s efficiency, provide them and their beneficiaries with access to doctors anytime, anywhere and decrease company health expenses. The new service which ensures user’s privacy and data protection will allow MenaME-Plus users to ask unlimited number of questions to doctors. The service will be available in 10 Arab countries where Altibbi and MenaITech operate; Jordan, Palestine, Egypt, Iraq, Saudi Arabia, UAE, Bahrain, Kuwait, Qatar and Oman. Altibbi’s platform provides healthcare related information and advice across the Middle East. It links patients in a confidential manner with accredited doctors and provides 24-hour medical advice. The medical site also maintains a directory of 12,000 doctors who have been verified and respond to the on-site Q&A page where patients can receive answers to their non-time sensitive health questions and communicate directly with multiple doctors. “This agreement embodies the concept of partnership between Jordanian tech companies operating in different sectors, to collaborate and provide new joint services to benefit the economy, institutions and human resources departments,” said Dr. Bashar Hawamdeh, CEO of MenaITech. Dr. Bashar pointed out that MenaITech is working to support Jordan’s leading companies and the economy through partnerships and adopting these innovative services and platforms. He predicts that this partnership with Altibbi will result in introducing unique services that shall increase productivity, reduce costs and effort on employees and human resources managements specially when it comes to health insurance. Mr. Jalil Allabadi stated his pride to be working with a big company like MenaITech which operates in multiple regional countries and will allow Altibbi to extend its services to employees from those countries. يتميز الموقع الالكتروني الجديد بتصميم مميز، تصفح سهل، خطوط متناسقة مع تصميم الصفحات بحيث يستطيع الزائر الوصول وبسهولة لمعلومات كاملة عن الهيئة، مرافقها، خدماتها، المركز الإعلامي وغيرها. 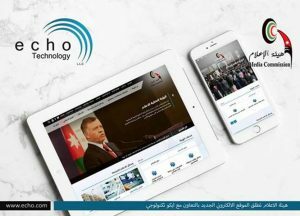 تتم إدارة محتوى الموقع الالكتروني عن طريق نظام EchoBus لإدارة المحتوى المطور من قبل ايكو تكنولوجي والذي يوفّر إمكانيات واسعة وشاملة للتحكم والتعديل على المحتوى دون حاجة المستخدم إلى خبرات تقنية. كما يحتوي على أكثر من 25 جزئية تهدف لجعل مستخدمي النظام قادرين على التحكّم بالموقع بطريقة متميّزة وسهلة واحترافّية..
Senior Executive Vice-President of CSR, Diversity, Partnerships and Philanthropy/Deputy Chair of the Orange Foundation, Christine Albanel affirmed the importance of Orange Jordan’s support of social responsibility projects in the Kingdom, pointing out the company’s active role in adopting many initiatives across all governorates and sectors. At the end of her visit to Jordan, Albanel talked about the different initiatives and programs implemented by the active parties and institutions in the Kingdom, affirming that Orange Foundation will continue supporting Jordan with an aim to positively contribute to helping the underprivileged segments in society, especially programs that focus on women empowerment and the youth segment. Albanel praised Orange Jordan’s efforts which helped implement many local initiatives and is in line with the key objectives of the company’s five-year corporate strategy “Essentials 2020” which aims to support the local community, thanking all the partners in the Kingdom who collaborated with the foundation and company, and gave them the opportunity to play an active role in the Jordanian community, within Orange Group’s corporate social responsibility plan. During her visit, Albanel and in the presence of the Executive Director at the Jordanian Hashemite Fund for Human Development (JOHUD), Farah Daghistani, inaugurated the Women’s Digital Center, which is affiliated with and supported by Orange Foundation at The Queen Zein Al Sharaf Institute for Development (ZENID), and is one of the five centers of JOHUD offering courses in digital training and entrepreneurship for underprivileged women in the Kingdom. She also met with officials at the Crown Prince Foundation (CPF) and discussed the strategies undertaken at the Orange Foundation, CPF, and possible future cooperation between both entities. Albanel visited the “Makani” center supported by Orange Foundation in 2015, through offering digital educational kits to students attending the center, including tablets that contain the official school curriculum for students who are unable to receive any form of formal education. Throughout her tour, she also visited the BIG platform; Orange Jordan’s growth-mode accelerator program, where she spoke with female entrepreneurs who joined BIG’s previous seasons such as “360 Moms”, “Sittat Byout”, “Masmou3”, Co-De, and Waragami, and listened to their future strategies, and ways of support and partnership. 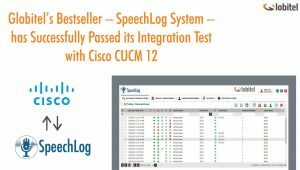 Globitel announces that its bestselling product, SpeechLog 7.6, has successfully completed and passed with flying colors the integration test with Cisco CUCM (Cisco Unified Communications Manager) 12. SpeechLog is a comprehensive call recording and a quality monitoring solution that supports any telephony environment, including traditional TDM and VoIP. SpeechLog records incoming and outgoing calls upon the enterprise’s configuration; it can record every outgoing and incoming call, or random picks for quality assessments and analysis. And a part of Globitel’s portfolio for over 20 years, SpeechLog has become one of our bestselling solutions and has helped thousands of call centers achieve their goals. SpeechLog runs on three conceptual factors; Operate, Capture and Learn. It gives the customer care operation a sleek functionality, with configurable call recording in order to analyze and train agents on delivering the best services. Following diligent and extensive work by the dedicated customer care team at Globitel, SpeechLog 7.6 was tested thoroughly in compliance with Cisco CUCM 12 criteria and was found to have passed the integration of the two products. The integration’s success is indicative of SpeechLog’s capabilities as an advanced call recording solution and its suitability to become a contact center’s reliable and sturdy crutch. إطلاق الموقع الالكتروني الجديد المصمم والمطور من قبل ايكو تكنولوجي تحت النطاق mawared.jo لجذب وتوجيه الاستثمارات ومشاريع التطوير العقاري على مستوى المنطقة. كما يوفر الموقع الالكتروني الجديد خدمات الكترونية منها خدمة استعلامات قطع الأراضي وخدمة تفاصيل الأراضي المتاحة للبيع بالإضافة الى إمكانية الوصول الى دليل الخدمات ودليل النماذج بسهولة. 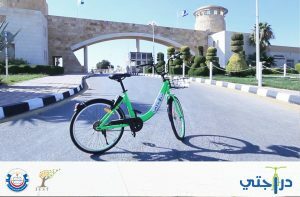 يشارك الموقع الالكتروني مع الزوار الفرص الاستثمارية، الإعلانات، الاحداث، الفعاليات، الصور والفيديوهات. بالإضافة الى إمكانية إضافة شكوى او اقتراح ليتم ارسالها للموظف المسؤول. 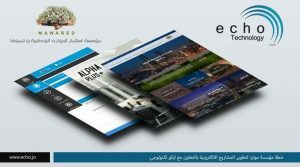 بوابة الموظفين الداخلية AlphaPlus المصممة والمطورة من قبل ايكو تكنولوجي والتي توفر كافة التعليمات والقوانين والانظمة ومكتبة الوثائق بالإضافة الى خدمة نشر الاخبار وعرض الاستبيانات. 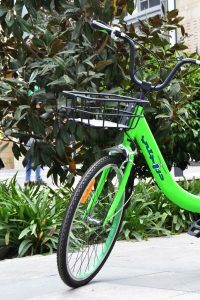 كما يقدم نظام AlphaPlus خدمات الكترونية متعددة من اهمها خدمة طلب الاجازات والمغادرات وخدمة كشف الراتب، ليوفر بيئة عمل أكثر مرونة واحترافية. نظام إدارة الوثائق Tera المطور من قبل ايكو تكنولوجي لغايات الوصول إلى بيئة عمل خالية من الأوراق، وبهدف توفير الوقت والجهد اللازم لتخزين الأوراق وحمايتها من السرقة والضياع والتلف، وتمكين التتبع الإلكتروني للوثائق وأرشفتها بسهولة وييسر. 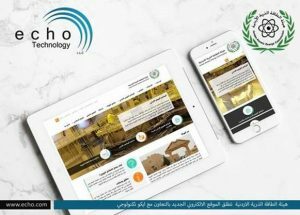 قامت الشركة الذكية للخدمات الهندسية بالتعاون مع جامعة العلوم و التكنولوجيا (مركز التميز للمشاريع الابداعيه) بتطوير مشروع الدراجة الهوائية التشاركية “دراجتي “ من خلال تطبيق دراجتي للهواتف الذكية داخل حرم الجامعة ، واللذي يمثل شراكة استراتيجية حقيقية بين الجامعة والقطاع الخاص من أجل إيجاد حلول ذكية لخدمة الطلاب والعاملين في الجامعة . نظام تشغيل الدراجة الذكية التشاركية هو الأول من نوعه على مستوى الوطن العربي , فلا يوجد نقطة بداية او نقطة نهاية,ولا اقفال مثبته على الارض لركن الدراجة, حيث تستخدم أقفال الكترونية مثبتة على العجلة الخلفية مزودة بتكنولوجيا اتصال عالية كتطبيق عملي لانترنت الاشياء (IOT) حيث بامكان المستخدم البحث عن اقرب دراجة اليه ومن ثم فك القفل الالكتروني من خلال تطبيق مثبت على الهاتف ، وقيادتها الى المكان المراد الوصول اليه ومن ثم ركنها عند الوصول الى هدفه. كما أن الدراجة مصممة بشكل يتوافق ويتلائم مع طبيعة استخدامها داخل الجامعة حيث ان شكل الهيكل فيها يمثل حرف V ليناسب كلا الجنسين الذكور والاناث، ويراعي السلامة العامة فهي مخصصة للتنقل والتنزة وليس للسرعة حيث تبلغ السرعة القصوى للدراجة 30 كم/ساعة. يهدف المشروع لمساعدة الطلبة والعاملين للتغلب على مشكلة السير لمسافات طويلة شاسعة كوسيلة نقل مساعدة ، كما سيساعد في تخفيف العبء الجسدي والنفسي للطالب حيث تعتبر الدراجه وسيلة نقل أمنه و صديقة للبيئة وبأسعار رمزية بهدف استدامة العمل والتطوير المستمر. كما سيوفر هذا المشروع فرص عمل للطلاب بنظام جزئي في أوقات فراغهم حيث انه ستوكل اليهم مهام مساعدة الطلاب على فهم الية عمل النظام و مهام متابعة وتنظيم الدرجات وإعادة تنسيق اماكن اصطفافها ومتابعة الأعطال الفنية والتقنية. هذا المشروع ريادي يهدف الى تنمية المجتمع والبيئة الجامعية حيث سيسهم في تعزيزثقافة استخدام وسائل النقل الصديقه للبيئه وممارسة الرياضة كما أنه سيبرز مدى التقدم التكنولوجي والحضاري للجامعة والأردن بشكل عام. وسيتم إطلاق مشروع الدراجة الهوائية التشاركية برعاية الأستاذ الدكتور صائب خريسات رئيس الجامعة وذلك في تمام الساعة 12.00 ظهراً يوم الاحد الموافق 14/10/2018، من امام مجمع القاعات الصفية داخل الحرم الجامعي. Orange Jordan inaugurated Women’s Digital Center at Queen Zein Al Sharaf Institute for Development (ZENID) becoming part of other centers launched in the Kingdom’s governorates under the Orange Digital Centers umbrella, as part of the partnership with Orange Foundation and the Jordanian Hashemite Fund for Human Development (JOHUD), to execute the Women’s Digital Center program for the first time in the Kingdom. 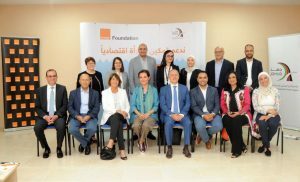 The event was attended by Farah Al-Dagestani, Executive Director of the Fund, and CEO of Orange Jordan, Thierry Marigny, and Senior Executive Vice-President of CSR, Diversity, Partnerships and Philanthropy, Deputy Chair of the Orange Foundation, Christine Albanel. The opening ceremony was attended by Chief Enterprise Officer at Orange Jordan, Eng. Mr. Sami Smeirat, and Chief Human Resource Officer at Orange Jordan, Ghada Fares, and Deputy Executive Director at JOHUD, Mohammad Al-Amoush, and media representatives. Executive Director of JOHUD, Farah Al-Dagestani, emphasized the importance of the technology and telecommunications sector, and investing in it to create new jobs for women, and contribute to enhancing women’s economic participation and engagement in the local labor market to achieve economic development and the Sustainable Development Agenda 2030. Al-Dagestani said that the partnership between JOHUD, Orange Jordan, and Orange Foundation, and comes as part of its efforts in which the fund undertakes to empower Jordanian women in different areas economically and socially. She considered that this partnership through which the Women’s Digital program is being implemented, would contribute to the empowerment of women in the digital revolution and e-marketing, which will contribute to finding job opportunities and new income resources for them and their families. Daghestani also praised this model of national partnerships targeted at building the capabilities of women in various fields, including technology and community leadership, and reducing the gender gap, indicating that the program includes the opening of digital centers in five centers affiliated to the fund in the Kingdom. From her side, Albanel praised the fund’s efforts with Orange, to implement this essential program, noting the organization’s keenness on spreading digital technology and guiding charitable initiatives in this field. She also stressed on the organization’s keenness to empower women through these centers, which makes digital education a starting point for independence, financial security, and career opportunities, as well as enhancing women’s financial independence. From his side, Marigny said that the Women’s Digital Centers program aims to help women of all age groups and segments of society throughout the Kingdom by providing them with the required training and skills needed to promote a better career, adding that the Women’s Digital Center comes as part of the Orange Digital Umbrella and is in line with Orange Jordan’s corporate social responsibility plan, which aims to add value to people’s lives and aspirations, and reduce the digital gap by providing educational tools to those who rely on digital education. He stressed Orange Jordan’s keenness on increasing its efforts to empower women and improve their life through sponsoring various conferences, events, and initiatives which aim to support the concepts of leadership, change, and sustainability. The program was implemented in five centers affliated to JOHUD, and spread across various regions of the Kingdom including Khaldieh, Al-Taibeh, Madaba, Al Hashmi Al Shamali, and Marka in Amman, to support, empower women, and provide them with professional skills and digital competencies, and train them on how to create and build small businesses digitally through various social network platforms and encourage them to invest in the field of Information and Communication Technology. The program also guides women on how to prepare monthly and annual budgets and reports, thus contributes to improving their living and economic conditions. Orange Foundation has successfully launched this program in 18 countries in Africa, Europe and the Middle East as part of its goal to ensure digital access for everyone. Orange Foundation is considered to be an active digital solidarity organization currently in 30 countries and is committed to three areas of charitable practices for companies which include education, health, and culture.